We are extremely late this week. I have not been able to use my laptop at home for some time now due to work being done on the house. To make things worse, I have not had internet in my office for the whole week. Numerous calls to the IT department produced no results. A big thank you goes to Kyle Maynard, our intern through the PEP program, who got us up and running not long ago. 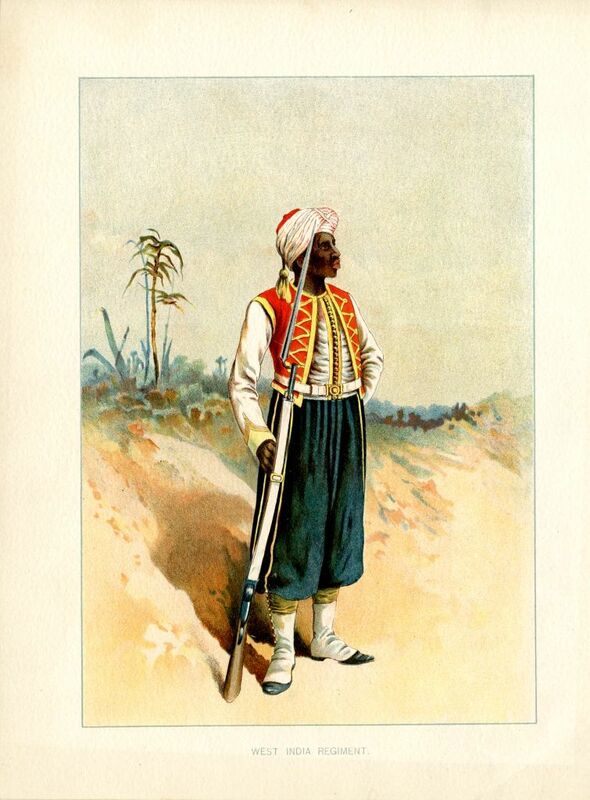 Today’s image shows the Zouave uniform of the West India Regiment as adopted in 1858. It was worn by all ranks below commissioned officer. This print is based on the artwork of Henry Bunnet (1845-1910) who made drawings of the various uniforms used by British troops. In 1795 Lt General Sir John Vaughan was given authority to create two regiments of black troops. By the end of that same year there were 8 such regiments. Vaughan’s reason for wanting this development had been the high mortality rate of English troops sent to fight in the wars in the Caribbean. He argued that the black and mulatto men who could be raised as troops in Africa and the West Indies were stronger and more capable of dealing with the climate. The planters objected but with the outbreak of wars against the Caribs in the Windwards, Vaughan won his case. In 1798 these regiments of which twelve had been created started being referred to as the West India Regiments. The 4th West India Regiment was stationed at Brimstone Hill for a short period. There were less than 250 troops in this regiment. Following an incident which seem to have been the result of an inebriated soldier making threats, the island Assembly panicked. A number of soldiers were court marshaled, one executed, and the regiment moved to St. Vincent in 1798. During the 19th Century, the number of garrisons in the region was reduced and the impressive installations like Brimstone Hill were left to crumble. The various companies of the WIR were engaged in routine garrison work with the occasional call for the troops to aid civil authorities in times of crisis. During the First World War, a West India Regiment served at Suez and then Palestine where it was not engaged in the actual fighting. Men from St. Kitts-Nevis served in this regiment.